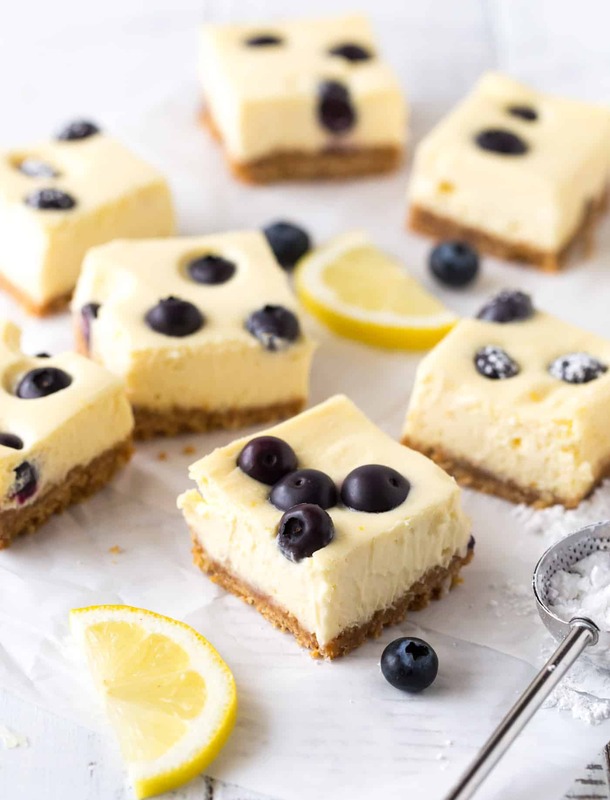 Nothing says spring like this light and fluffy Lemon Blueberry Cheesecake Bars recipe! 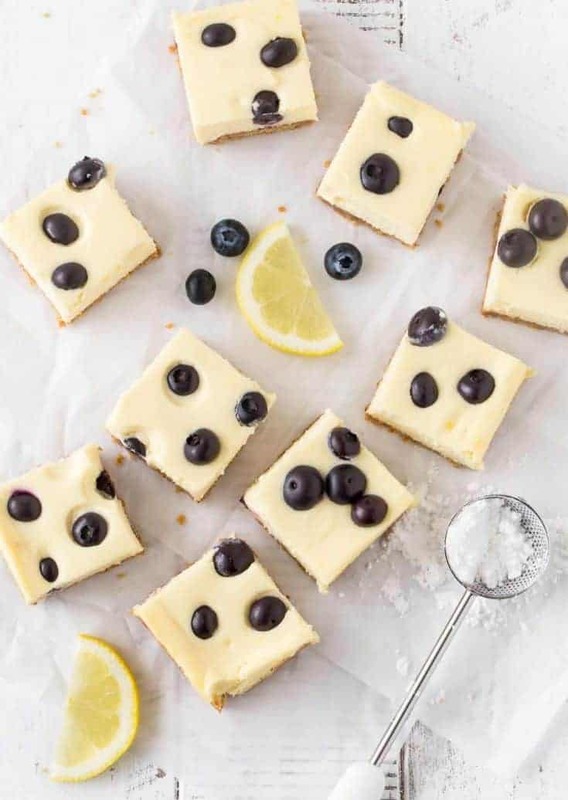 In honor of the idea of spring making an appearance, I made you some Lemon Blueberry Cheesecake Bars. Because nothing says spring to me quite like the flavor of a lemon dessert. Plus, if we eat like spring is coming, the snow will melt, right? Cheesecake bars are a perfect dessert for a crowd. You get all of the delicious cheesecake flavors in portable form. What is the best way to make cheesecake bars? Lining the pan is the first step. You’re going to need an overlap of parchment paper or nonstick foil to use as handles to lift the cheesecake bars out of the pan when you’re ready to cut and serve them. Next up is the graham cracker crust. Stir together some graham cracker crumbs with cinnamon, sugar and melted butter. Evenly press into the bottom of the prepared pan. Tip: I like to use the bottom of a drinking glass to press the graham cracker mixture into the pan to keep the crust even. All that’s left is to make the cheesecake batter. This recipe uses a food processor instead of a mixer to make it come together even faster. Evenly spread the cheesecake batter on top of the crust. Drop the blueberries over the top of the batter, they will sink a little and sink even more when they bake. 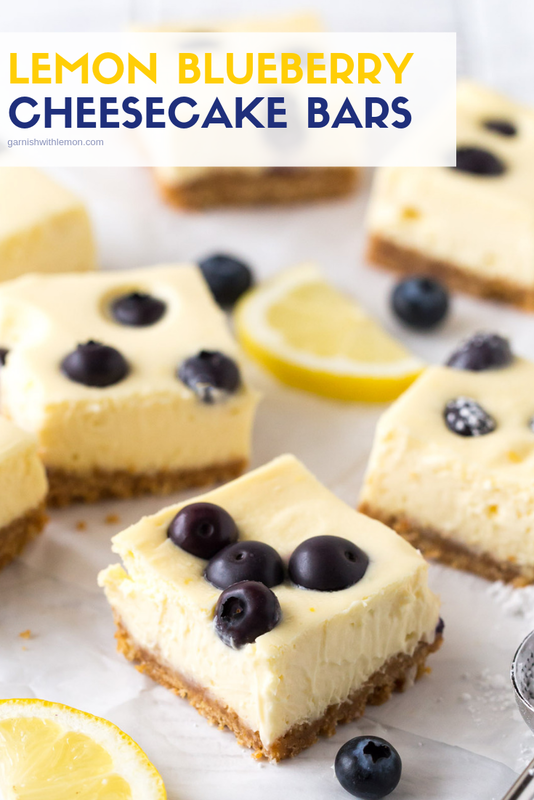 The crunchy graham cracker crust with the creamy lemony filling and pop of fresh blueberries makes these Lemon Blueberry Cheesecake Bars sooooo tasty. And – bonus – they are not a dense, heavy dessert, which is perfect for spring. The lemon filling is light and fluffy, which obviously makes it OK to eat about 5 of these in 10 minutes. 🙂 They are super easy to make and will be ready for the oven in only 20 minutes. Can I make the cheesecake bars ahead of time? Absolutely! I have to admit there is one downfall to these bars: you need to let them chill and set before you can devour them. The waiting is the hardest part. But that also makes them a great make-ahead dessert. And an added bonus is that they freeze beautifully, just pull them out of the freezer before serving and you are good to go. Desserts don’t get much easier. So join me in saying NO to more winter and YES to spring. Even if we can’t control the weather, we can have some say as to what happens in the kitchen. Hopefully, Mother Nature will be on our side, and the worst is behind us. Preheat oven to 325 degrees. Lightly grease a 9 x 9 square pan and line with parchment paper. Mix all of the dry ingredients in a small bowl and add the melted butter. Stir to combine and press in prepared pan. Bake for 10-12 minutes. Remove and let cool for 10 minutes. Place the cream cheese, eggs, lemon juice, lemon zest and sugar in the bowl of a food processor and mix until thoroughly combined. Using a spatula, scrape into the cooled crust. Drop blueberries on top.They will sink slightly and sink a little more and burst when they bake. Bake for 35 minutes or until set in center. Cool completely and then chill for 3 hours to set. Remove bars from pan and cut into squares, dust with powdered sugar and serve. Keep leftovers refrigerated. Thanks, Liz! Hopefully spring will be here before we know it! Wonderful combination of flavors in these bars. My little one would adore these. She loves anything that has to do with cheesecake. It’s the best when the whole family likes them! Thanks, Christie! These are beautiful! Looks like the perfect desert to add to an Easter menu. Thank You for another lovely recipe! Thanks, Katie. I absolutely devoured these! Love the spring flavors, it will make the weather change, right? I’m totally all over these and totally over winter!! !